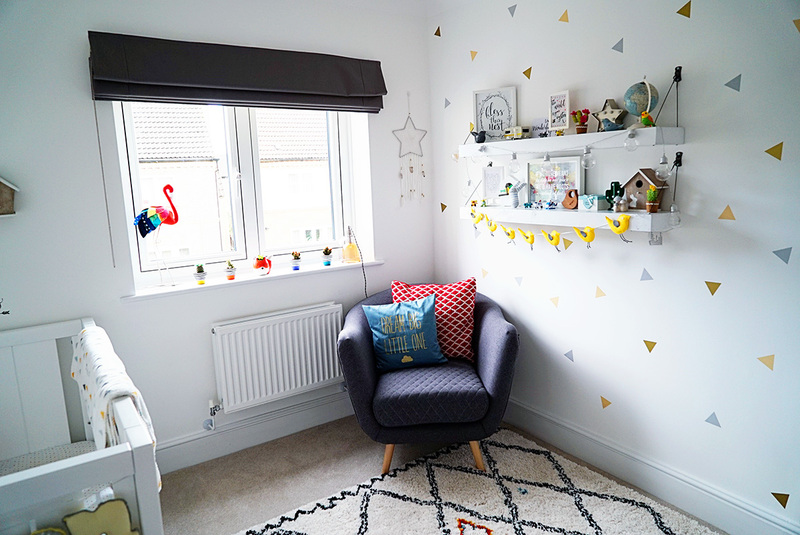 When we moved into our new house at the start of June we decided that the first three rooms we would tackle would be our play room, our girls bedroom and our baby boy’s bedroom. This was mainly because we wanted to get them all settled and into a routine as much as possible. 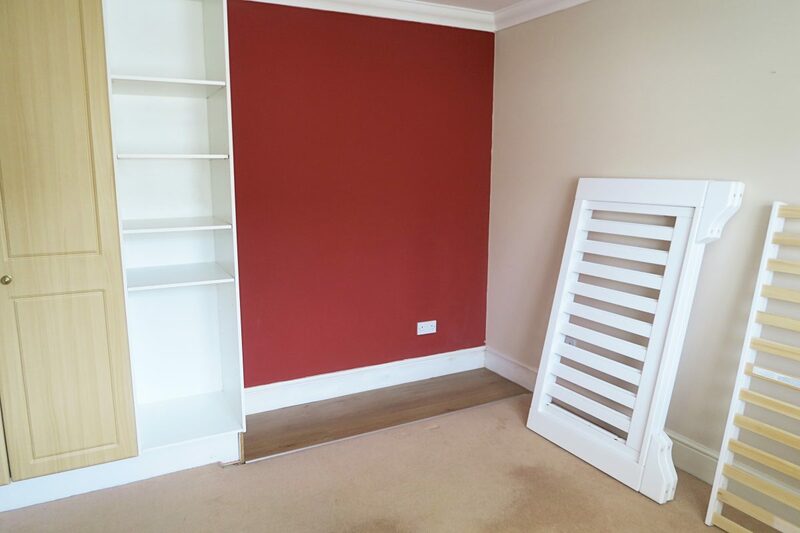 We got straight into planning painting and decorating the rooms, putting down new carpet and buying any bits of furniture that we needed. 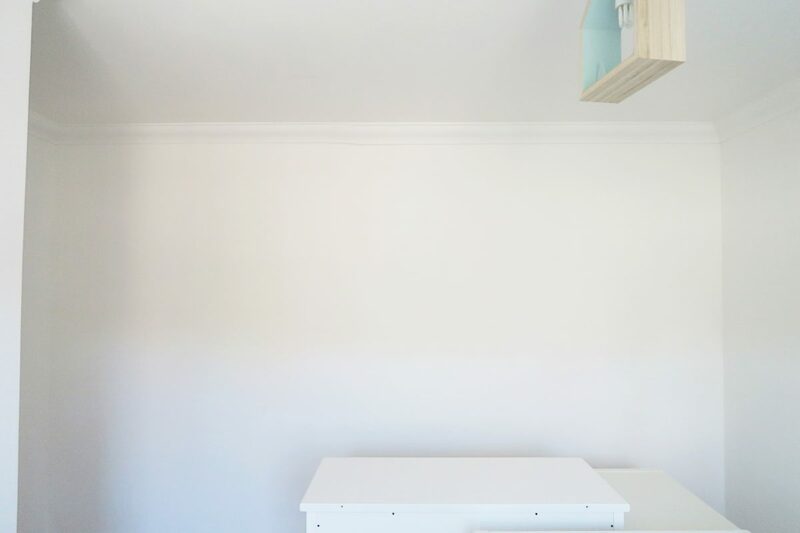 Our baby boy’s room was the easiest room to begin to sort out and plan because we had only previously just done his old room in our old house. 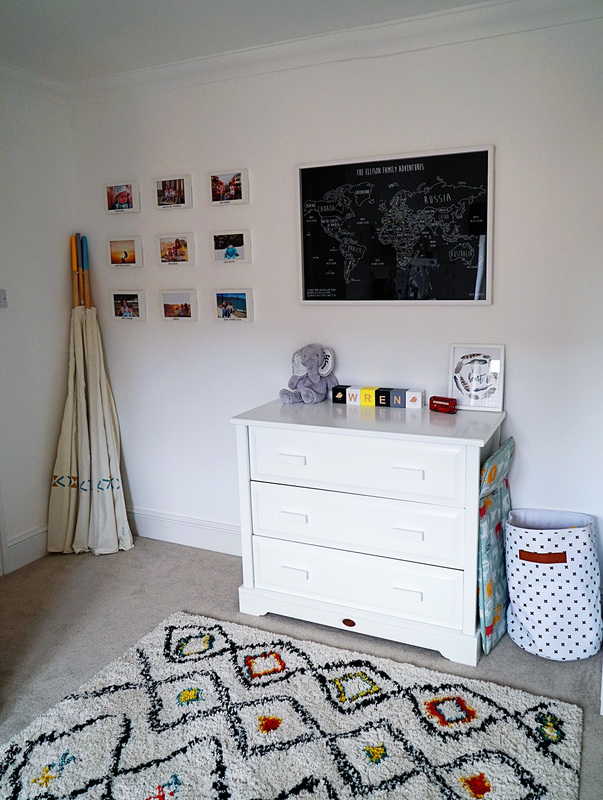 Therefore of course we would be taking the furniture and bits that we bought for his room with us, plus the way I had designed it was still fresh in my mind and I wanted to recreate it in this one too. 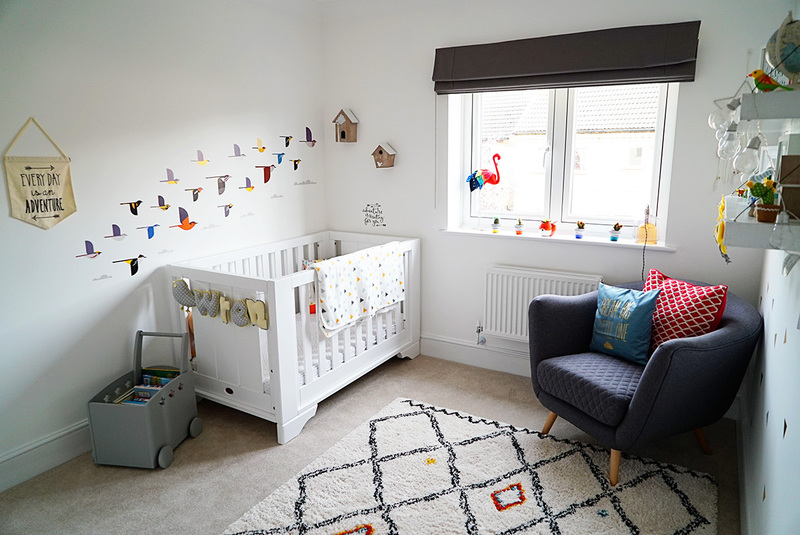 However his new room is about four times the size of his old one, so there was still a fair few things to get in order to make the room into a home. His old room was the smallest bedroom in our old house but was more of a box room, his new room is still the smallest bedroom (third child problems), but all the bedrooms in our new house are a really big size and it is one of the reasons why we bought the house in the first place. When we moved in the first thing that we noticed about his new room was that it absolutely stank of smoke. It had been the previous owners teenage son and we had noticed it when we were looking around the house, they obviously used to let him smoke in his room. All the paint was very yellowing due to smoke and even with all his furniture gone you could really smell it. The first thing we did pretty much as soon as we moved in was get it painted and change the carpet. Even then the room continued to smell a little bit and I couldn’t understand why. We finally got his window replaced just this week and that has got rid of the smoke smell completely (it must have seeped into the wood). The below photos are after a nice lick of paint, but before the new carpet went down. 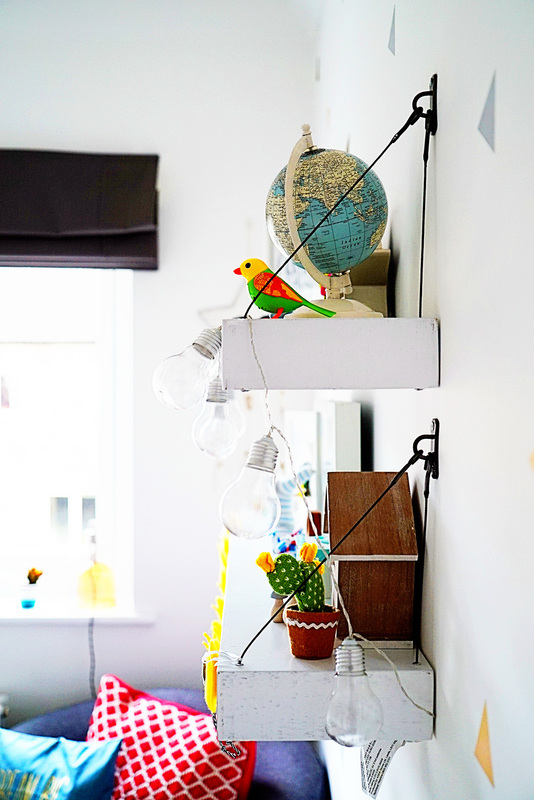 I decided to keep the room a similar style to in our last house, which was a bird/travel theme, due to his name and nickname being our little bird and also because as a family travelling is one of our biggest passions. However to be honest the whole room is just a bit of a mish mash with no real theme. The top three photos are of the three main areas of the room. The camera doesn’t pick up just how big it is but it really is a great size considering it is our smallest bedroom. As you walk in through the door of his room the first thing you are greeted with on the left hand side is his photo wall. What I have done is make a photo wall of all the places he has been abroad. 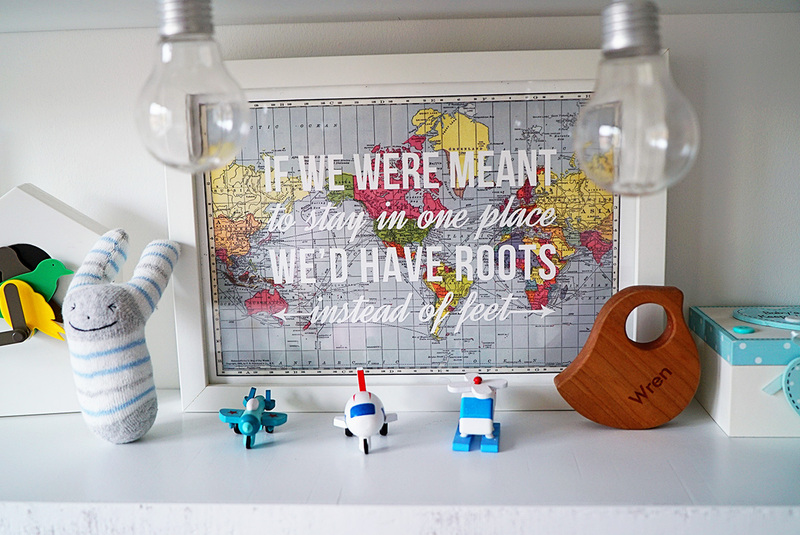 He is very lucky (or rather we are very lucky) that he is a very well travelled baby and has been to lots of places considering he is only one so I wanted his room to reflect our love of travel. 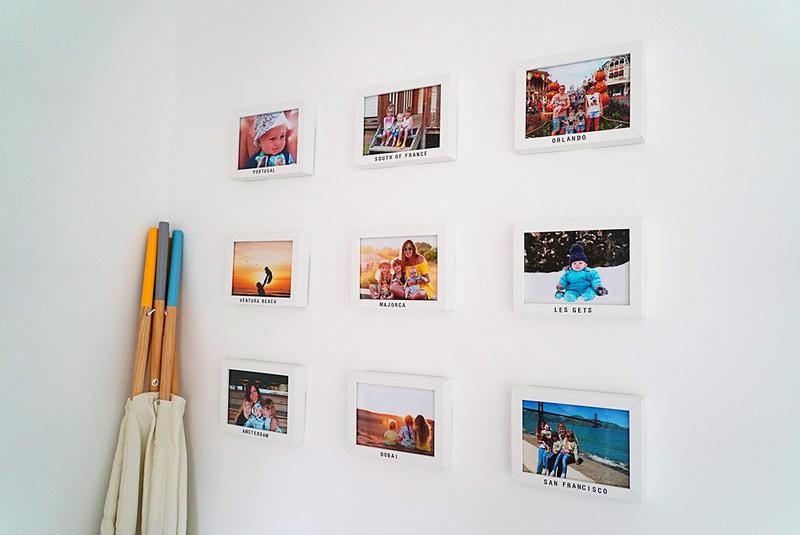 I got a load of IKEA RIBBA frames as they are pretty cheap and easy to replace if you break one or need more. I then bought some letter stickers from Amazon and got some photos printed. The frames are attached using command strips which I love and wish I had found out about a lot sooner- they save you putting lots of nails and screws in the wall. I deliberately left lots of space so we can add more frames in the future. His chest of drawers have come with us from our previous house. 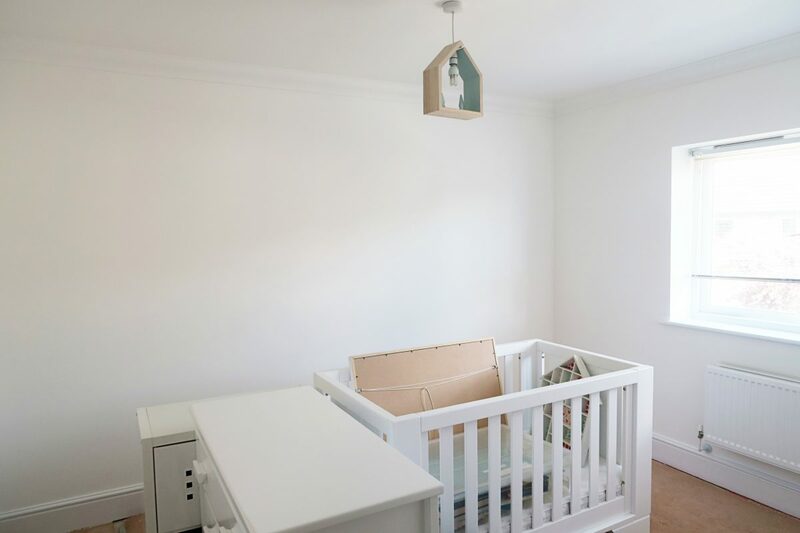 We got them from a company called Boori who do really great quality nursery furniture. His map again has come with us from our old house and I still absolutely love it. 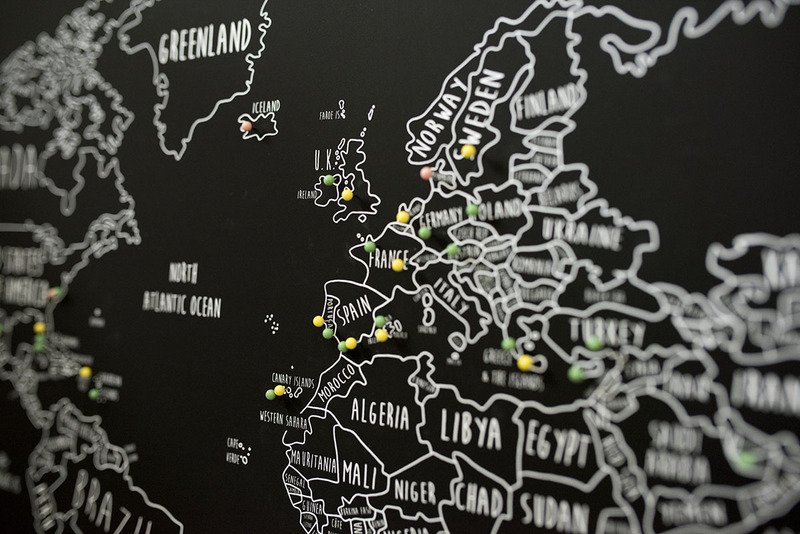 We love travelling and it is a personalised map which you can document your past or future travel adventures on. I had been looking for a map that we could pin where we have been on to it. I just hadn’t been able to find anything I liked, until I found Louisa Elizabeth on Not On The High Street. It couldn’t have been more perfect for what I wanted. She has a variety of maps in different colours and sizes, and you can choose your key to correspond to your travels. 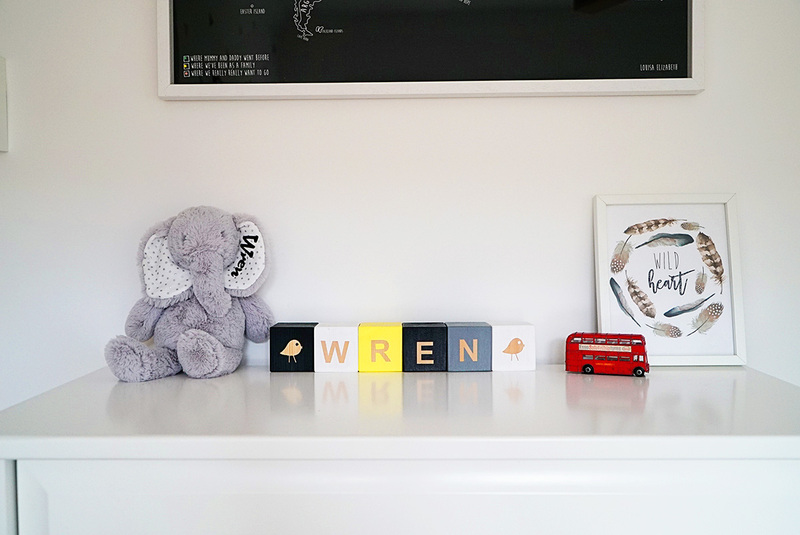 His little name elephant is from My First Years, the personalised blocks are from Myla and Oscar over on instagram and his Wild Heart print is from Freddie the Kid on instagram. The little bus I used to play with at my Nana’s house and she said I could take it back with me last time I was there. 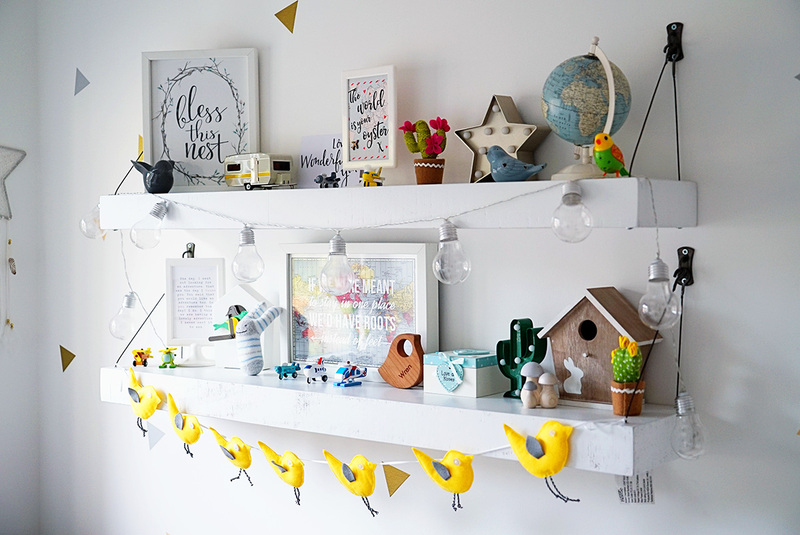 I love this corner of the room as it is both colourful and calming. 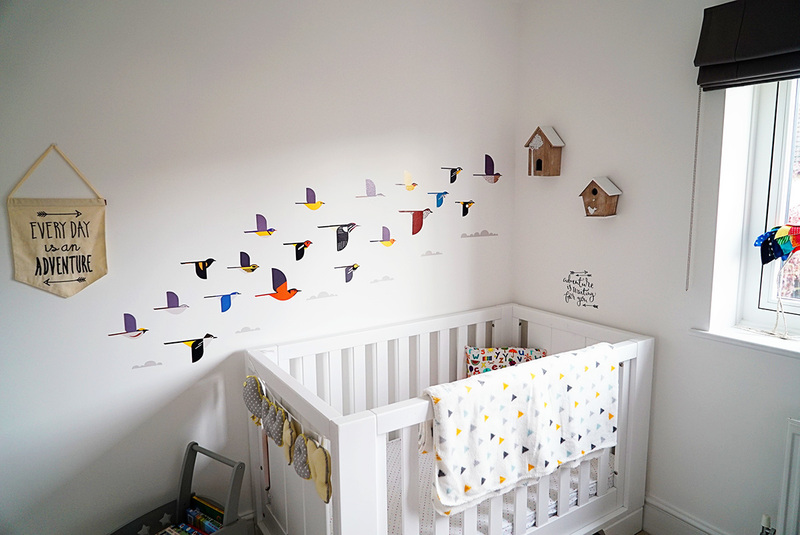 We had the bird wall stickers in our old house and as soon as I knew we were moving, before anything else I bought them again as I just loved them so much and they sum up our little boy totally. They are from a company called Trouva and I love them as they are colourful and bright. 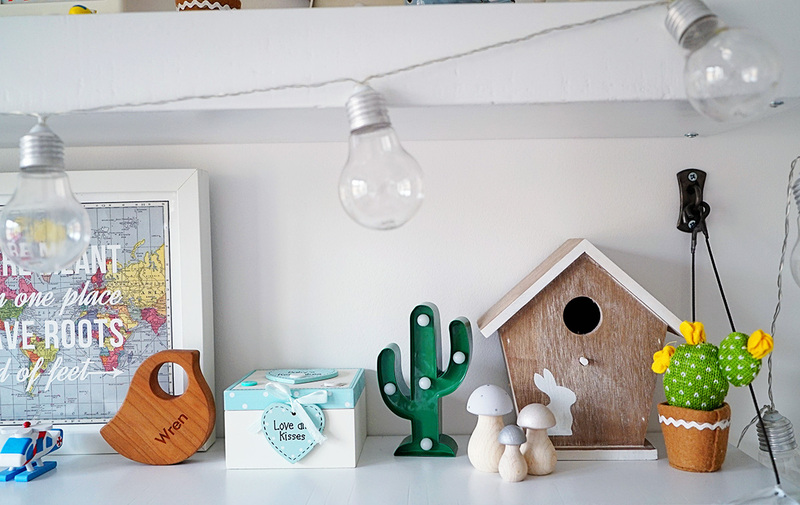 They are flying up to these wooden bird boxes from Maisons du Monde (if you haven’t checked out their furniture and accessories then you need to as they have loads of choice) but unfortunately I think they are sold out now. His cot is again from Boori and is a cot bed so will grow with him as he grows. His little wall sticker which says ‘adventure is waiting for you’ is from yet another company on instagram called Blossom and Bear (I love finding inspiration on instagram). I’m a big fan of prints to brighten up a dull wall. We like to get them from a variety of different places and I spend ages online searching for them. 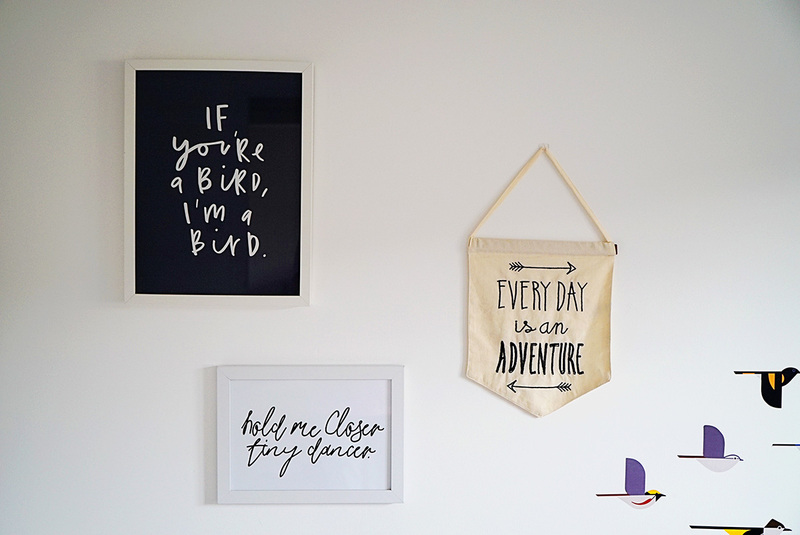 The top ‘If you’re a bird, I’m a bird’ one is from Old English Prints (it used to live in our old dining room and is a quote from one of my favourite films- The Notebook). The ‘Hold me Closer’ Elton John Lyric print is from Honeymoon Hotel and the ‘Every Day is an Adventure’ banner is from This Modern Life. The next corner of the room is probably my favourite part of the whole room. 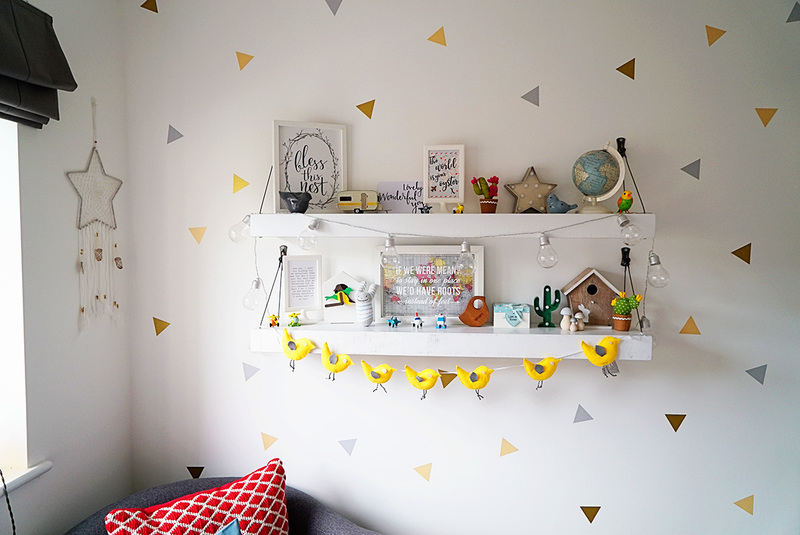 Originally this wall and space was very white so I added some triangle wall stickers from Etsy just to give it a little bit of colour, and I am really pleased with the result. 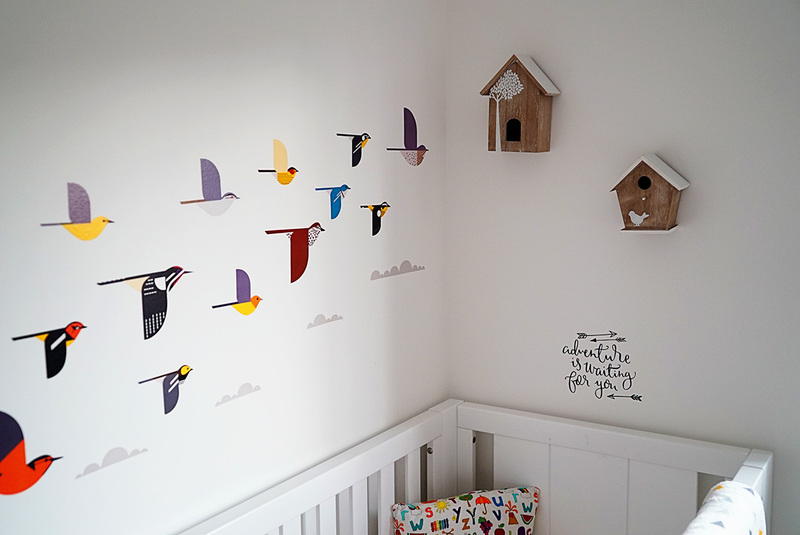 I am a big fan of wall stickers (only really in kids rooms) to add a bit of colour that can be easily changed if needs be. The dreamcatcher is simple but gorgeous, I love the star and the fact that it also has feathers on it to tie into the bird theme. His wooden shelves are from La Redoute and I absolutely love them (even though Jon wasn’t impressed having to put them up! )- they are just a little bit different with the hanging metal bits and the distressed white wood. I love choosing things to go on the shelves, it’s one of my favourite parts of designing a room. The trinkets are from here, there and everywhere. 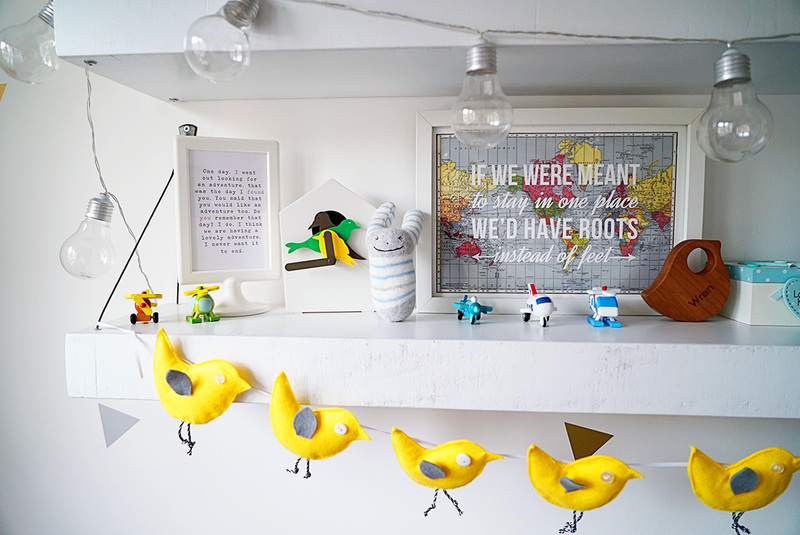 The ‘If we were meant to stay in one place…’ print is from Not on The High Street, the little wooden airplanes came in a pack of 12 from eBay (I got them cheaper than this but they seem to have gone up in price). The light bulb lights are battery operated and were a bargain £5.00 reduced in Asda but they have since sold out. 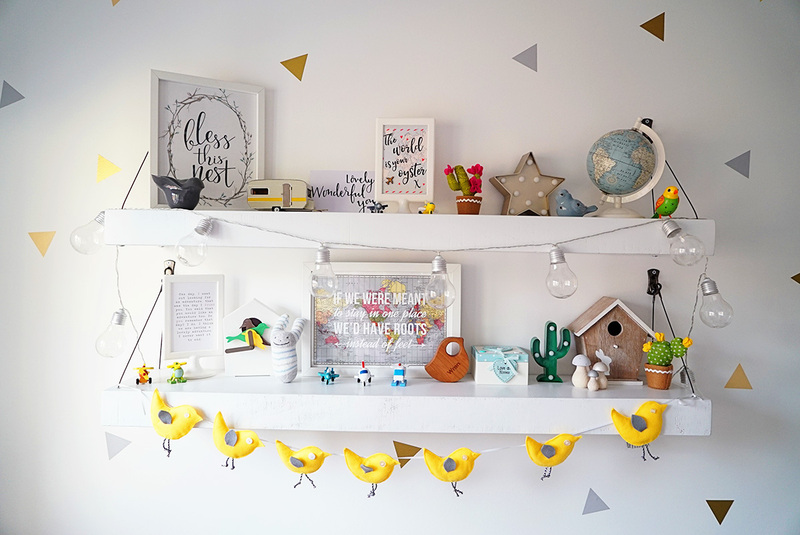 The felt bird garland is also from Not on the High Street and I really love it, it is such a great site for finding amazing bits and bobs. 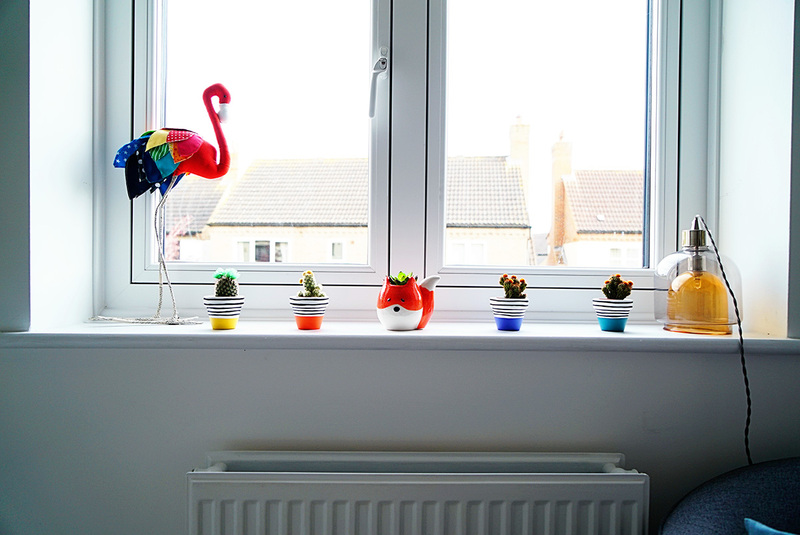 His new windows really make the room which sounds silly but if you had seen what they were like before you would understand- they were rotting and not very nice. I have added a few different trinkets to the windowsill. The flamingo used to live in the girls old bedroom and was a present from their Auntie Paula, the fox plant pot was a present from my Mum from New Look (can’t find it on the website), the light is from John Lewis and we have had it years, and the little painted plant pots are from Etsy from a very talented seller called This Way to the Circus. I really wanted to get him an chair to sit on and read him stories as he gets bigger and I found this grey ‘Flick’ armchair in the summer sale at made.com. 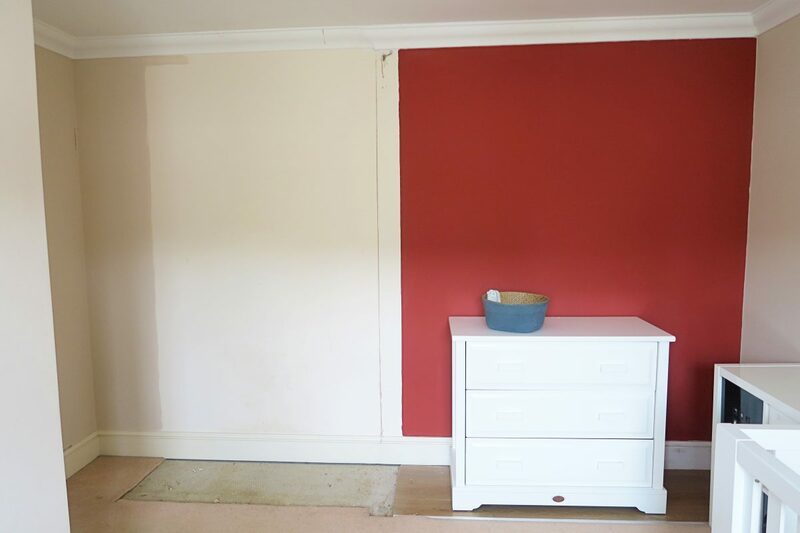 I got it in grey so if we ever wanted to move it into a different room in years to come it was quite a safe colour. 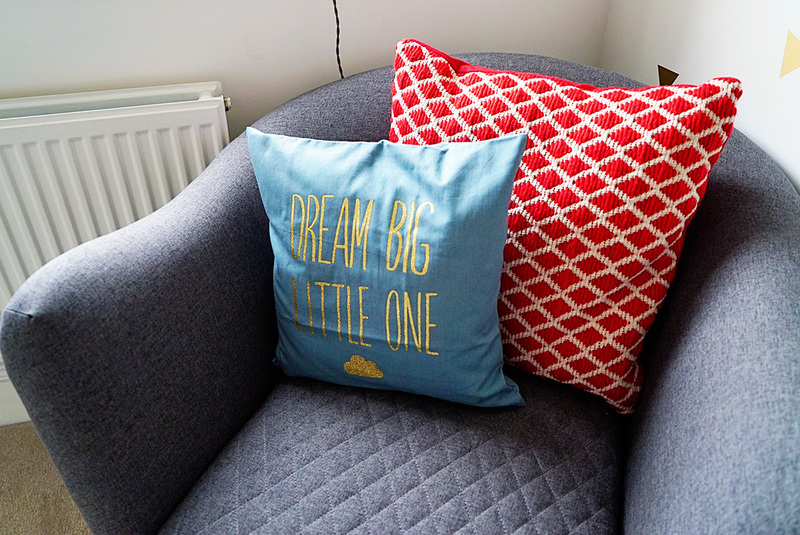 The ‘Dream Big Little One’ cushion is from H and M Home and the red geometric cushion is from Next. Finally the only other last things to talk about in his room are firstly his rug of dreams from La Redoute. As soon as I saw this fluffy but colourful berber style rug I knew I had to get it (I mentioned it on my video but big tip for La Redoute is to never buy full price as they often have discount codes). Jon and I joke a lot about rugs but he always claims not to understand why I love a rug in every room- to me they make a room complete. The little grey storage cart I get asked a lot about if I show it on instagram, that is from Vertbaudet and we put his books in it. And that is it, his finished room. We are so pleased with it. 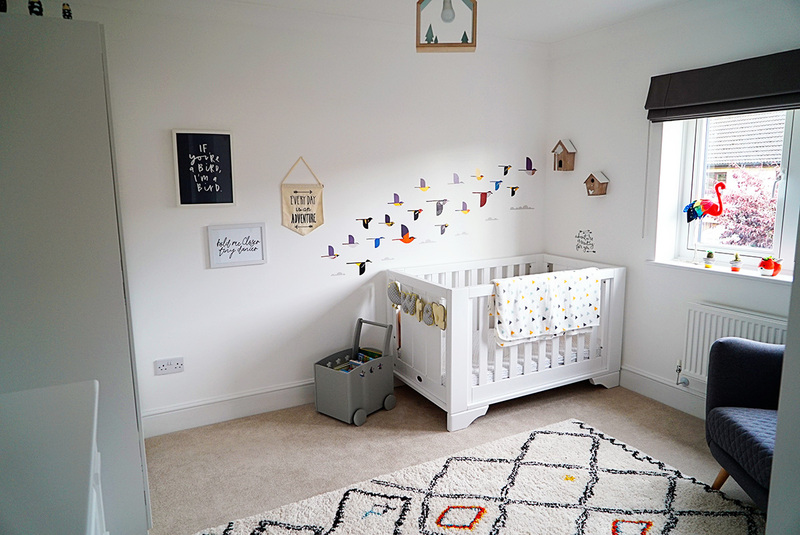 The camera can be deceiving but it is quite a big size room, but I think we have made it feel cosy and a lovely space for him as he grows. 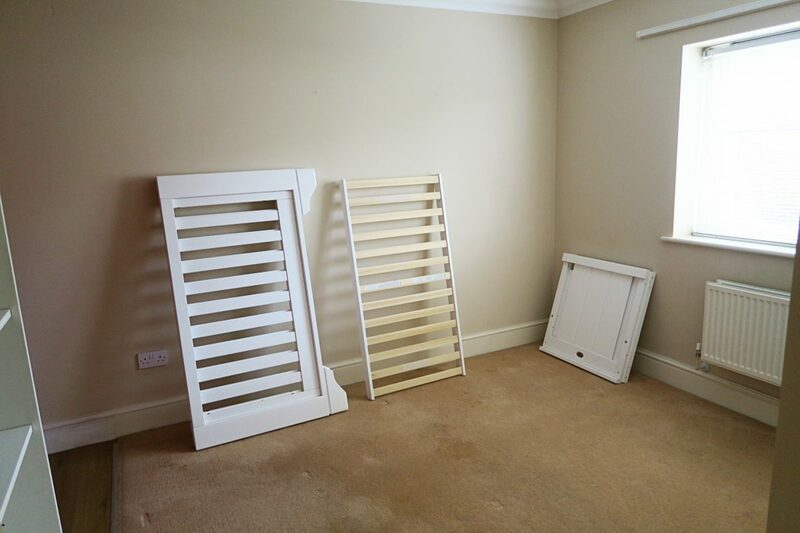 There is still room for more furniture in the future too, for when we upgrade his toddler bed to a full size single. I also might add some bookshelves under his travel photo wall at some stage too. But for now that is it. 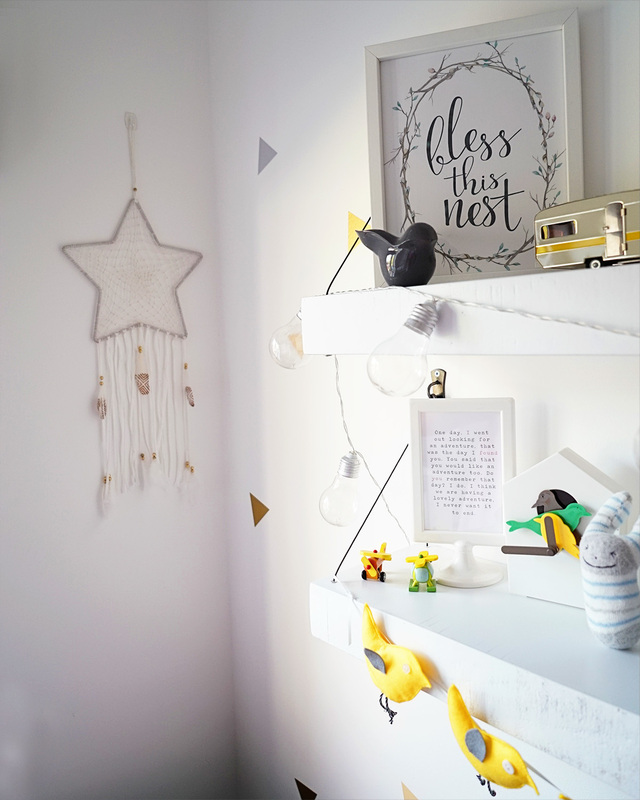 The perfect space for our little bird. 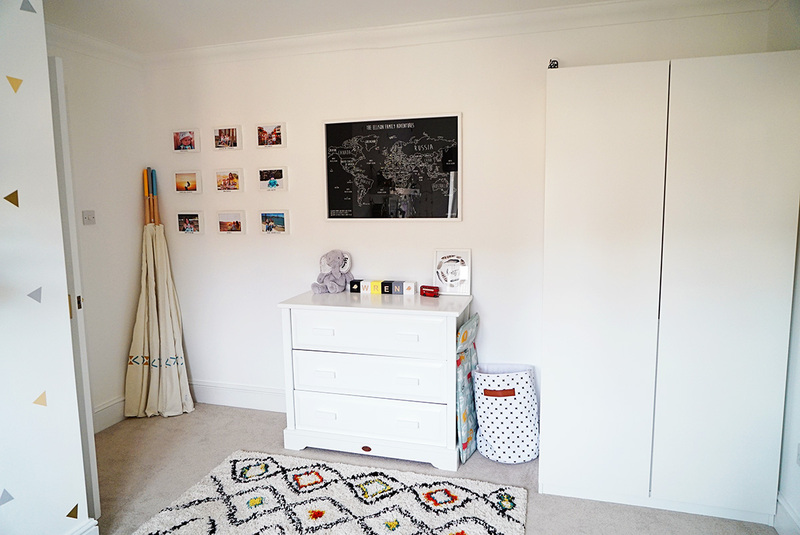 I love what you have done with Wren’s room it is such a lovely nursery and full of fun, adventure and color Love that already at his age he has been in so many countries and places that’s an experience that is so special and amazing. He will be well cutlural before ten years old for sure. Love the way you decorate the house is coming along so well. I will have to visit one day soon lady! I love the photo wall! 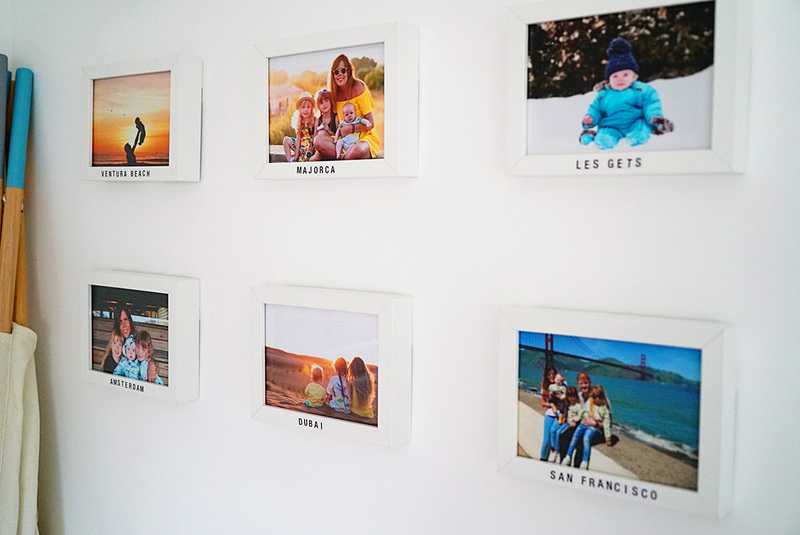 So nice seeing the memories of all your travels with your little ones. Colors and textures are great and finely arranged.Thank you for sharing these inspirations.